Base 4, Base 5, and Base 10 pieces including mats, strips, units, and linear pieces. Area pieces are made from 30-mil yellow styrene and die-cut for easy separation. Includes 40 mats, 100 strips, and 200 units. Each unit is 1 cm X 1 cm. 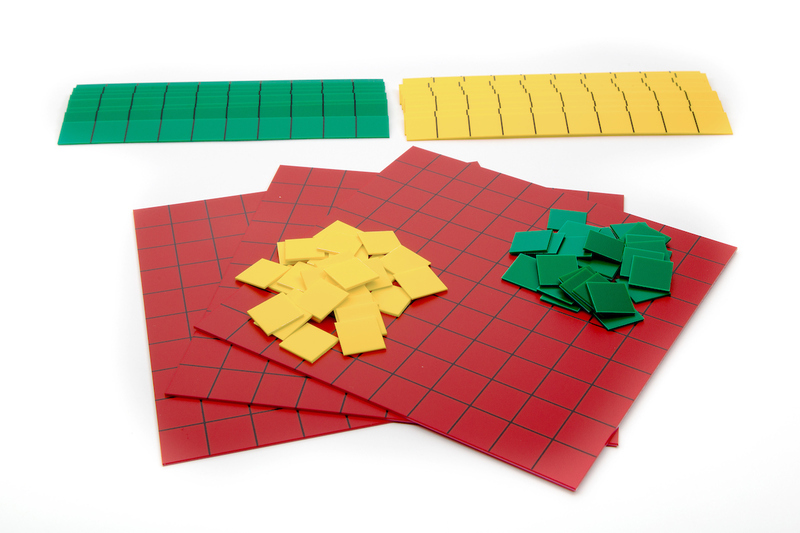 1 inch-long units for use with colored tile to create area models. Class set has 10 individual sets each of which contains 30 units. Pictured colored tiles sold separately. Set of 200 linear edge strips for use with Large Base Ten or Large Base Five Area Pieces. 0.33 cm wide by 20 cm long, black plastic with white unit marks. Includes 10 plastic storage bags. Black plastic linear unit pieces for use with Large Base Ten or Large Base Five Area Pieces, 0.33cm wide by 2 cm long. 8 bags, 100 units per bag.